Why does some beetles have long and heavy horns? What's up with narwhals and their nasty tusks? Why did the now-extinct saber-toothed tiger develop long canine teeth? These are just a few of the dozens of important questions that evolutionary biologist Douglas J. Emlen set out to provide answers for in his new book titled Animal Weapons: The Evolution of Battle. Evolutionary biology is a very complex topic but thanks to Emlen's writing style that is both clear and engaging, you can learn a lot about it without having to go through exhaustive scientific jargon. In short, Animal Weapons: The Evolution of Battle can be palatable to readers who usually don't thumb through science-based books. Emlen also keeps things interesting by narrating stories of his excursions into forests, jungles, and savannahs where he studied animal weaponry for years. Another unique feature of the book is the way Emlen constantly makes parallels between the weaponry that animals developed and the weapons that we humans created. For instance, Emlen points out a similarity between beetles battling and hardened knights trying to bludgeon each other in medieval Europe. In essence, Animal Weapons: The Evolution of Battle is not merely a biology book, it's also a history book on how mankind evolved with regards to developing defense mechanisms like weapons of mass destruction. Animal Weapons: The Evolution of Battle is published by Henry Holt and Co. It's available on hardcover and it's 288 pages long. The author is a professor at the University of Montana. Accompanying Emlem's text in the book are illustrations by David J. Tuss. Photo by Gustavo F. Duran. Listen to author Emlen talk about the process through which he came up with the book below. If by any chance you can't view or listen to the SoundCloud file, you can read the full transcript of the audio that follows it. "I'm a biologist, I study beetles. I know this is an odd qualification for authoring a book on the world's biggest weapons but it's more relevant than you might think. Many beetles wield spectacular weapons. In some dung beetles for example, horns can be longer than the rest of the male beetle making way more than a third of its body weight. That would be like you and me producing another leg and wearing it around on our heads. 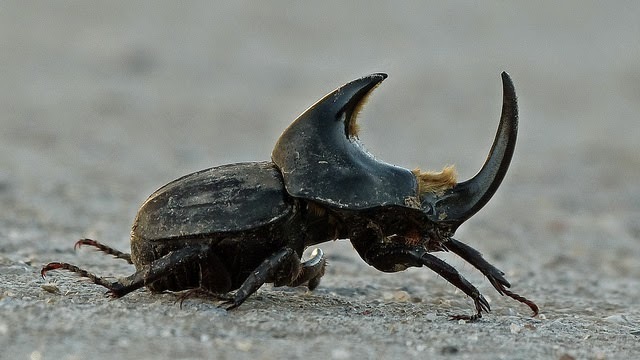 Rhinoceros beetles have pitchfork horns that jut forward from their faces like spatulas and stag beetles have mandibles or mouth parts that are so big the males have to waddle instead of walk. What's not to love? These are magnificent creatures. These are among the most extraordinary animals ever described. And each of these beetles produces weapons that are so big they look absurd like they should tip over or trip or collapse under the weight. Why are their weapons so big? Is there such a thing as too big? These are the kinds of questions that I set out to answer and these are the animals that I studied. As a scientist I wanted to understand the biology of these extraordinary weapons. I've watched these beetles for long hours in tropical forests. I've dug them out from African Serengeti dirt with armed rangers sitting perched over my back on the tops of cars with rifles to protect me and watch out for lions or cape buffalo. I've reared thousands of these beetles in my laboratory. I even started a study of their genes and the developmental pathways that orchestrate their growth. But still the answer to the riddle of these weapons was left hanging. So after twenty years traveling the globe in search for answers, I chose to step back and try a completely different approach. To look beyond the beetles. For this search, I went to libraries instead of rain forests, to dusty museum floors, to internet search engines, and I pored through hundred years of literature to glean all that was known about weapons in all animals living and extinct. I was especially interested in the extreme weapons, the biggest of the big, the Boone and Crockett champions of the animal world. Photo of beetle by Jacinta Valero via Flickr. It turns out, there are all sorts of fantastic weapons in surprising places. So we've all seen the antlers on deer or elk but huge weapons crop up in all kinds of species from tiny little New Guinean flies to earwigs, ants, wasps, New Zealand crickets, walruses and crabs. These are the stories that I set out to tell in this book weaving together for the first time the narratives of nature's heavily-armed creatures but in the process of weaving together their histories, it became clear that there was another species that belong in the mix, and that was humans. The more I saw common threads, themes uniting the stories of these diverse animal species, the more convinced I became that these threads apply to our own species too. And in the end, my book about animal weapons evolved into a book about extreme weapons everywhere. I started poring deeper and deeper into the literature surrounding our past, searching for the environments and circumstances in which our most extravagant weapons evolved. And to my amazement, these circumstances were the same. I realized I can't tell one story without telling the other. Back and forth I went as the biology of animal weaponry and our weapons fused inextricably woven into a single tale. So this is a book about extreme weapons. What happened then is that a journey that began with biology became the story of all weapons as readers collide between beetles and battleship crabs and the Cold War. What lessons can we glean from these animals around us? And where does this insight leave us today in a post-Cold War world filled with the deadliest weapons of all time, nuclear, biological and chemical weapons of mass destruction. The answer surprised me and I'm guessing it will surprise you too."